Barnsley Civic Trust runs a ‘Blue Plaque’ scheme to honour significant Barnsley people and events. ‘Blue plaques’ are put up to recognise a building or place’s connection with a significant person from Barnsley or with an event in the history of Barnsley. The person might be a prominent individual in the history of the borough or someone whose achievements are more widely known. By agreeing a Blue Plaque, we celebrate these people – the Best of Barnsley – and what they have achieved. Some Blue Plaques have also been erected to commemorate events which took place at the location rather than the people who lived, worked or studied there. You can contact Barnsley Civic Trust if you want to make a proposal for a Blue Plaque. Your proposal will then be considered by the Barnsley Civic Trust committee. 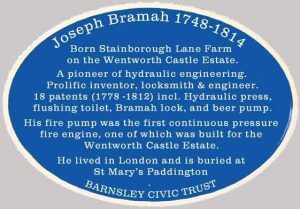 Details of the Blue Plaques put up in Barnsley will be added to this page.